Cards by America: Crafty Sentiments, Sketch Challenge #6, How Does Your Garden Grow? Crafty Sentiments, Sketch Challenge #6, How Does Your Garden Grow? 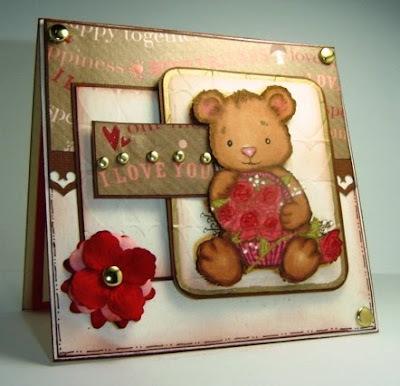 Hello and welcome to another wonderful Crafty Sentiments Sketch challenge to get that creativity flowing! :) Come check it out at the CS Blog HERE. 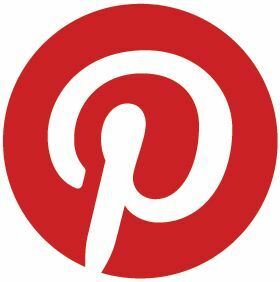 This week's inspirational part of the challenge is to incorporate the color *Kraft* (or any color of a soft brown that closely matches kraft) into your projects. It is always a bonus if you use Crafty Sentiments stamps but any stamp will work! Here is my take on this the sketch. 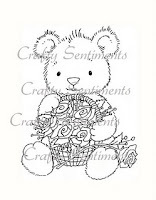 Stamps: Crafty Sentiments Valentine Collection "Teddy With Flowers"
I love both of these cards, America! Gorgeous colors and what a cute stamp! Fab card America, love the way how you use the the stamps well done. Both of these are darling. Beautiful coloring and rockin layouts. Adorable cute cards, America. Love them both and the stamp is super too. Thanks for sharing. Ohhh wowwww America what a beautiful cards,i love your images and colours. These are beautiful and cute all at the same time...Love them! This is absolutely beautiful! I am going to have to get those stamps! Love your designing skills! Amazing America! Your color is so rich and vibrant! Adorable image! !